In 1865, two young immigrants arrived in New York where they later met and developed a partnership that lasted for many years. The first, George Pusch, had sailed from Bremmen, Germany and the second, John Zellweger, arrived from Switzerland. Both were 18 years old and on their own. 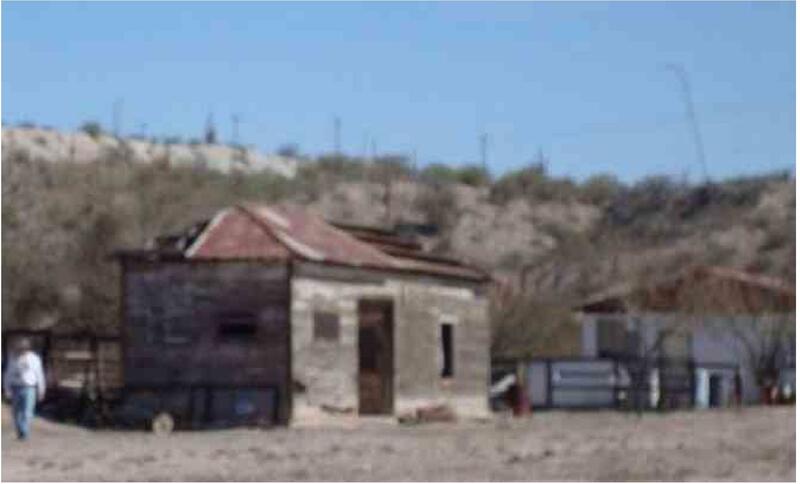 They worked in butcher shops in New York and held various jobs across the country including Saint Louis and San Francisco before establishing a cattle ranch along the Canada del Oro north of Tucson. He adds: “At the age of 27, George Pusch thought the time had come for him to be a “Py Gott, big cattleman!” So, he bought a wagon and a span of 14 mules and headed from San Francisco to Prescott in the Arizona region. Then it was on to Phoenix and finally to Tucson.” Pusch recruited his friend Zellweger to come with him, and together they bought ranch land and cattle and established the “PZ” brand. Pump house and blacksmith shop in 1928. 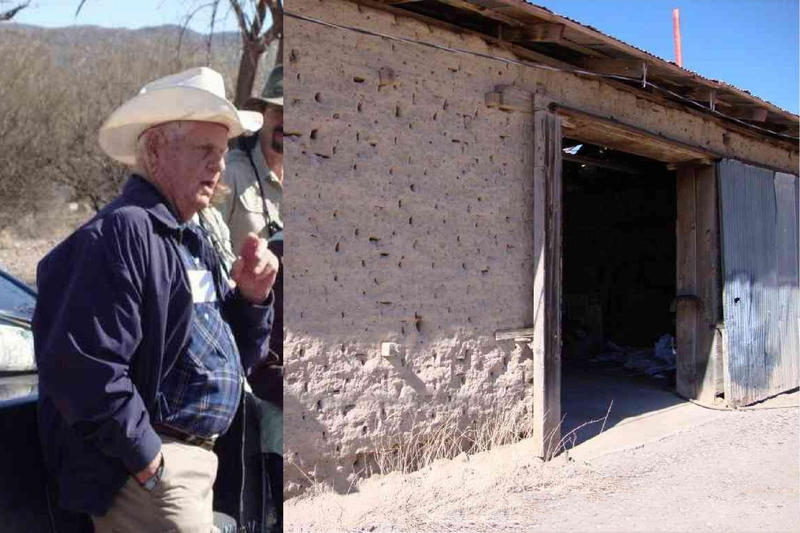 George Pusch hand dug a well at the ranch and purchased a steam driven pump to propel water from the well into holding tanks. The pump was housed in a tall adobe building with an adjacent blacksmith shop. 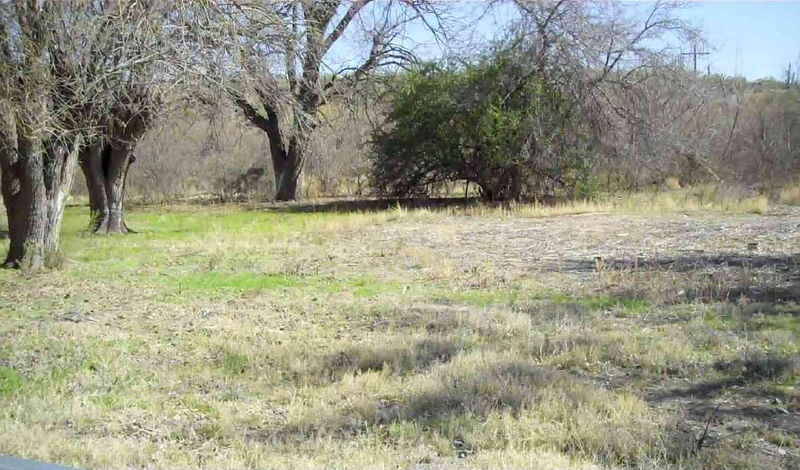 This ready supply of water, for both people and cattle, led to the name the property retains today. 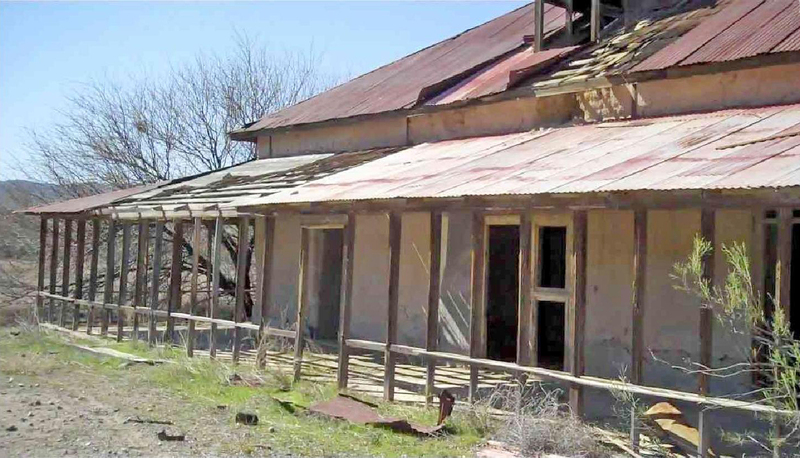 By the mid 1880s, “Pusch’s Steam Pump” was a well-known location. Pusch and Zellweger shared additional business endeavors. They opened a butcher shop in Tucson in 1875, and they owned the leading slaughterhouse and wholesale/retail meat firm in the city from 1875 until 1925. Another shared venture was the Tucson Ice and Cold Storage Company, also established in 1875. Gertrude Pusch, Henry’s mother near the Ranch. In 1881 Pusch married Matilda Feldman, a young woman recently arrived from Germany. Two years later, John Zellweger married a friend of Matilda’s. He then sold his interests in his Tucson businesses with Pusch and relocated to the Florence, Arizona. Between 1883 and 1898 George and Matilda had nine children (twin girls died shortly after birth). 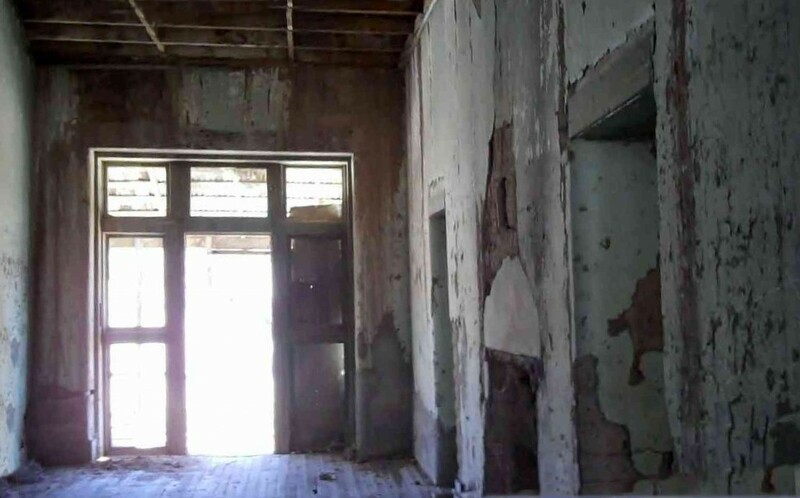 They maintained a residence in Tucson where Pusch pursued business endeavors such as director of Arizona National Bank, chairman of the Territorial Livestock Sanitary Board, member of the Territorial Legislature in 1891 and 1899, and member of the state constitutional convention in 1910. Pusch suffered a series of strokes beginning in 1914 and died in 1921. Zipf sums up the years following his grandfather’s death: “George Pusch, Jr. took over operation of the Steam Pump Ranch in August 1921. On June 27, 1928 George sold Pusch Land and Cattle Company and the properties owned on Congress Street. In 1933 J. M. Procter bought the Steam Pump Ranch from Matilda’s estate shortly after her death.” Thus, a new era of occupation began at the Ranch. (Patricia Spoerl 2011). Pat Spoerl, president of the OVHS Board of Directors, invited Henry to share his memories. The following is a record of his presentation as he walked the property on Feb. 15, 2010. OK, I can’t very well walk but I can point them out. This was our home over here ( pointing to the large two story house). This was a blacksmith shop. It was a pretty busy place as I remember as a kid. Don’t know if it had the shed on the side. 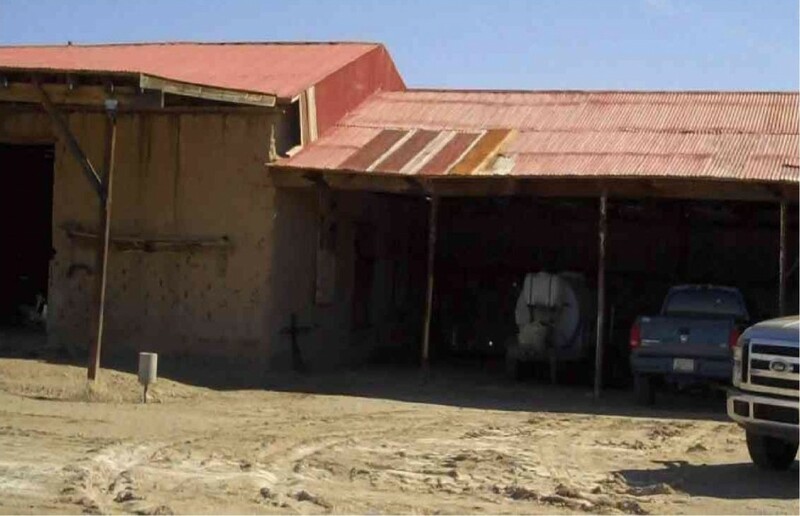 I just remembered the old adobe building. This silo over there was for the grain raised in these fields and put in that silo. I remember the smell of the silage they put in there. One year my dad raised a bunch of hogs. The hogs were kept over there in pens. He had a couple of sows and gave one to me and one to my brother, He had a prize of a dollar for the one that had the most pigs; I won. My brother cried, so the next day he took a couple of pigs out of my place and put it into my brothers, he got the dollar that time. He had a bunch of pigs, they were out in this field, he would get out there and yell “PIG, “PIG and they would come running from all over. A good thing about the pigs is that they would get rid of the rattlesnakes. There were a lot of snakes out here because there was water here. Those pigs would go after the rattlesnakes. 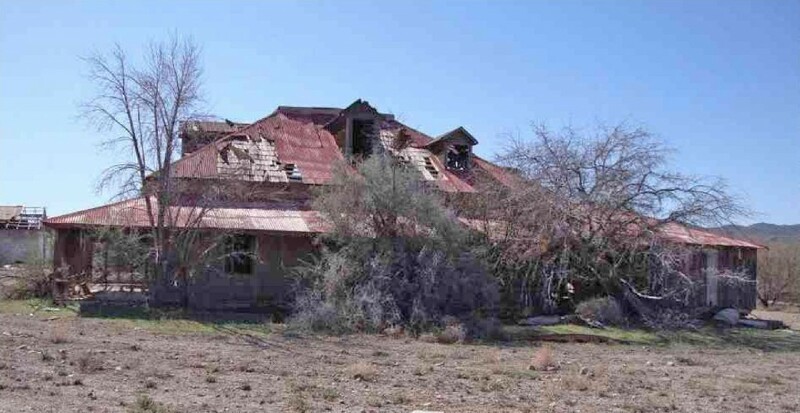 This house here, a two-story, we had a porch that ran all the way around the north end of the Feldman Ranch House. We would sleep on the porch because it was cool. It didn’t have any heat, it had a fireplace in the middle and an old kitchen. It was rather roomy, a nice place. The school teacher would live there with us. And, when they had roundups, the cowboys would come in and occupy part of it. Once in a while, we would find rattlesnakes under the bed. On the other side, we had chicken coops. The coyotes and skunks would get in there. We had a couple dogs and they would go after them and those dogs would smell for a week. To me it was a very spacious place, I didn’t realize that it really wasn’t that large. Once in awhile there was an old Indian that would come to the back door of the kitchen and demand food, we’d give them food, my grandmother would give them some food. 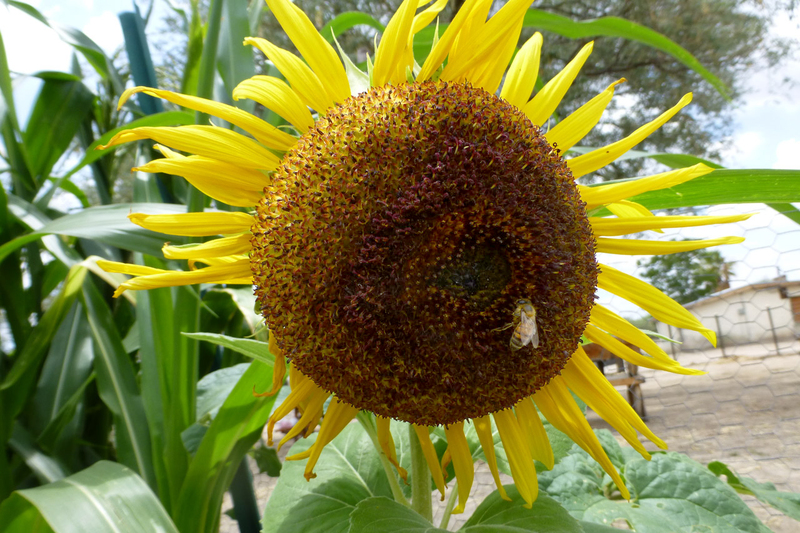 The Indians lived right over at the Aravaipa and some on the ranch. That building where the white building is, I don’t recall that. But, the other building we had a store and we had a post office there. My mother was a post-mistress. My older brother Walter at times ran the store. That white building up there, was a church, Catholic church. I’m not real positive about that, but that was about where the church was, I don’t think it was that large. My grandfather gave them the land, and they built a church About once a month the Priest would show up and ring the bell and all people from all around would go to the church. The building over at the far end was a granary and that’s where they would store the grain. 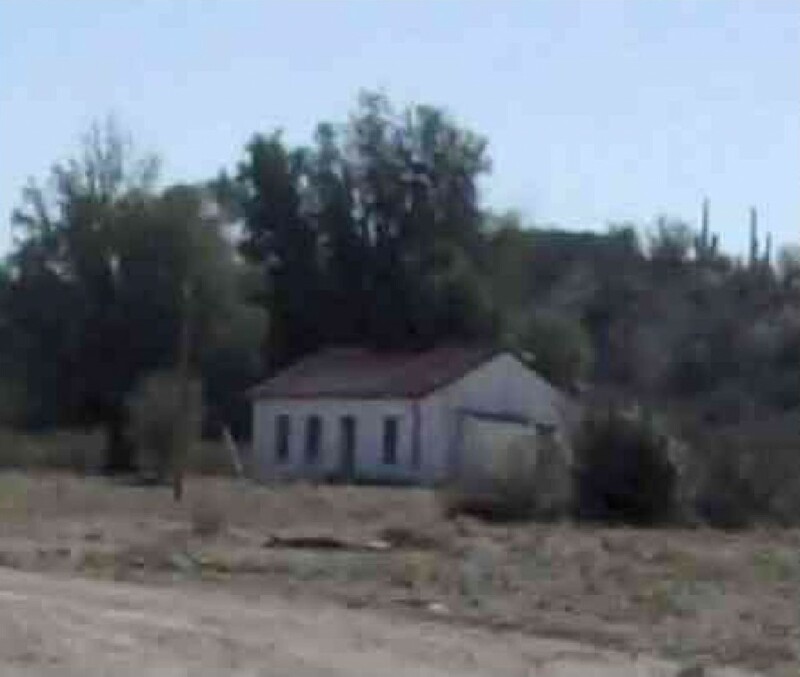 There was a little side building built on the side of it and that was a school house. I went to school there for about two years. I have a picture that was taken and I can’t find it. There were ten of us. We had a woman by the name of Kirkpatrick who would come down from Winkelman as our school teacher. That poor woman would have to take care often different kids in ten different courses. Then later a Miss Scott was a teacher and she lived in the house with us. As a result, I got l’s, top grades. That teacher had to do it you-see, had to, she lived with us. That old building is gone a lean-to. That granary was always full of grain from the fields and we would play around in it I thought that was a big building, it isn’t really. This road will take us to what we had as a lake in those days. Springs from the Cook Ranch would move over to this ranch and built that Lake in there, it was a good-sized lake. We could fish and hunt, my dad would hunt and fish and so forth. There was an old house back there where a caretaker sort of lived. I haven’t been back in there, guess the lake is gone, I don’t know about the lake. Some maps we brought out to show Henry the lake area, in 1997 it started drying up, in 2000 there was no surface flow out of the spring. In 2006 there was a flood and recharged the springs a little. My grandfather was involved in a lawsuit with respect to the water from the river. There were good springs around here, we got lots of water. We had a boat over there on the lake we would swim and fish My dad would hunt a lot of duck and a lot of other birds would come in. And it is a pretty area with a lot of trees and growth, and vines, it had a lot of growth in there. When I was a kid, there were two people that lived on the Cook Ranch I just remember them as an old family, man and wife, and their name was Cook. We would stop in there and get a drink of cold water. I didn’t see a lot of them, they were off to themselves. I don’t know if they ran cattle or anything. My grandfather ran cattle in here, over 15,000 head. He brought them all the way over from Oracle Junction, over where that Saddlebrooke development is now, they ran them all the way across. This, of course, was the headquarters. Right down here somewhere was an irrigation ditch that ran the whole length, always full of water. He had wells here. That canal was always full water, I think it came from the lake. I don’t remember any dikes in that ditch I just remember the old irrigation ditch and they took some water out of the river. You know I was just a little kid about 6 or 7 years old. The old road that we came in on out front, that’s the old road that we had. There was a heck of an arroyo just a little ways up that old road, I bet that arroyo is still there. What my mother told me, my grandfather owned the Steam Pump Ranch on Oracle Road and First today. 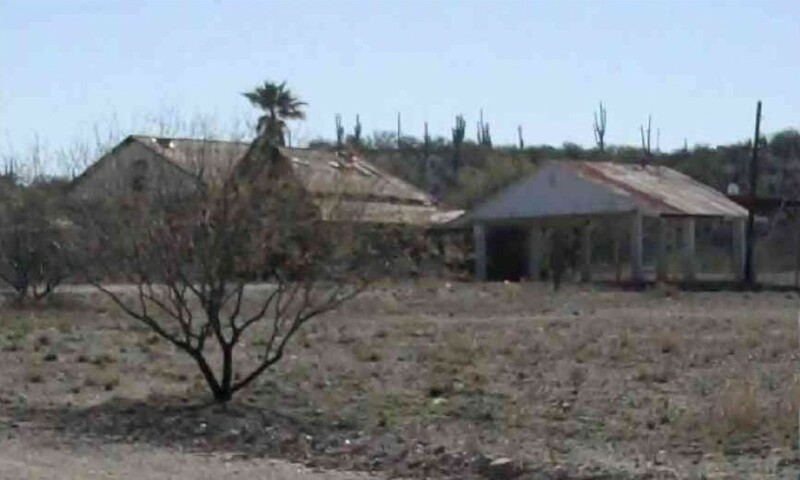 That was a ranch where he developed water to water cattle that they had here in Pinal County, Mammoth and everywhere else. They bring them into his ranch to water and then load them at Red Rock to ship or Tucson. He got ten cents a cow or something like that and built the Steam Pump for that purpose. And that was a place they would drive from Tucson the first day, to the Steam Pump, stay overnight, then they would come across from the Steam Pump across what they called the Antelope Plains and that ended up in Finch Canyon. 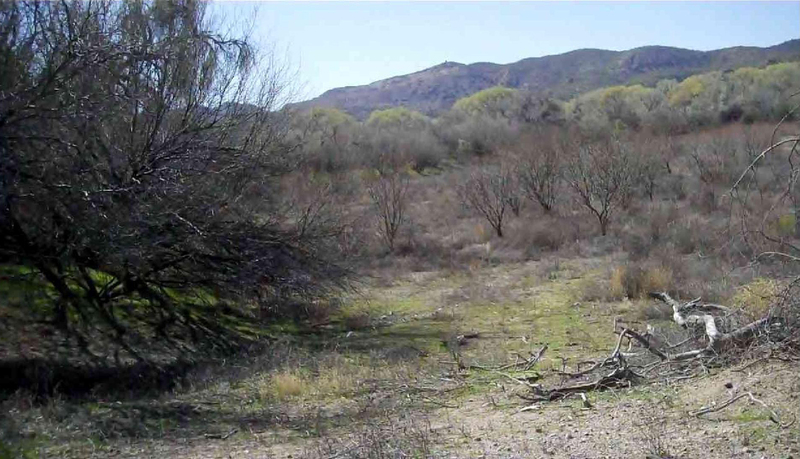 And that would come in about where Aravaipa is and then there was a road that would come in up here. Maybe that was Putnam wash, that makes sense, that’s the one I was trying to think of My mother would come across in a wagon, not me, I’m not that old, pretty close. Anyway, they would come along in these old wagons, my grandfather who developed the whole area never carried a gun. And the Indians, my Mother told me, would surround the wagon as they came into this area and he had sugar and flour and other provisions that he would give them so they never bothered him. He had two young daughters, Mabel and Mimi who had long blonde hair. The Indians would come off their horses and run their hands through their hair, but other than that, the Indians never bothered them. The Indian kid was born somewhere down here in the San Pedro and he was a renegade. Maybe it was the Apache kid. 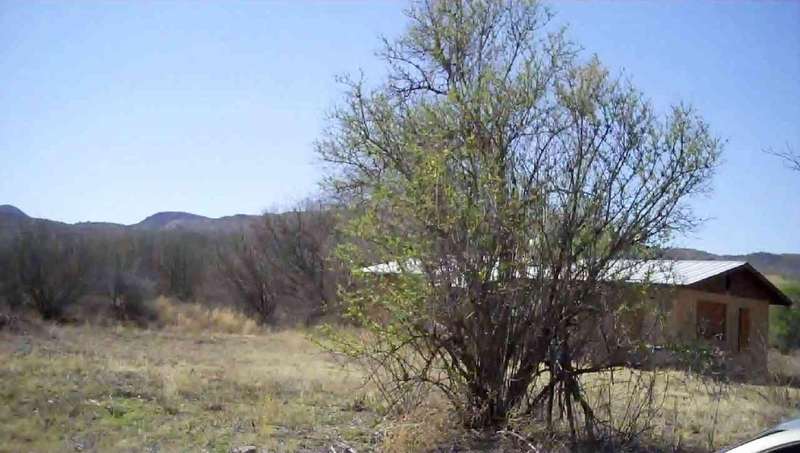 He would ravage up and down this valley but never cut a fence on the ranch They lived over in the Aravaipa. I don’t remember that of course, my mother was telling me this. They called it the antelope plains because she said they would run into herds of antelope and have to stop the wagon. When I came out here because of a couple years they needed someone to run the ranch range and my dad who was really not a rancher, he came and operated it. I can remember him getting up at daylight almost every day and going out on the ranch They farmed all this and had cattle. I can remember around 1924 when they had a drought and the cattle would all come up to the ranch because there was water here and they had to fence them out. Otherwise, they would come in and over drink. They had to keep them out away and let them in slowly because they had been out in the boondocks with no water. That drought was tough on all the ranchers. I can’t remember a heck of a lot about the school but we did have about 10 people. I remember one guy called Junior Harrington. He had a problem, he had to go out and relieve himself every once and awhile, that’s a heck of a remembrance about a guy. Had another nice guy by the name of Juan, who was the top guy down there. I can remember a little bit. I’ve got this picture of the class holding this number, I can’t find it. Anyway, I can remember a little bit about the school. Every Saturday or Sunday, I’m not sure which, my brother and I am would run out to the highway and sit there and wait for the stage we called it. It was just a big old car, a long car that went from Tucson up to Winkelman and they would throw off a paper and I think that was the only communication we had with the outside world. We didn’t have any radio or television set. That was a big deal we would bring the paper in. I can remember my dad gave us each one of us a burro. There was a comic strip at that time, I can’t remember the name, but the comic strip had a couple of horses or bulls in it, can’t remember the name. It’s a good joke, I’ll think of it, can’t come up with it right now. But we had burros, but as kids, we did not get around too much A big deal was to go into Winkelman or Hayden because they had a drugstore there and we would get ice cream. Winkelman and Hayden at that time were pretty active. The mines were working and also the smelter. I don’t know about today. We had no electric power but had coal oil lamps and little coal oil heaters. I can remember we would put a pot of water on the top of it. I don’t know why. We didn’t have any kerosene, that all came later. I don’t remember this ever being a hotel or anything. When we were there, it was my brother and myself my dad, my mother, the school teacher all lived here. When they had the roundups the Cowboys would come in and they sort of occupied one-half of the house and we would occupy the other. It had an old kitchen in it and a bathroom that you had to heat the water up on an iron stove and carry it into the bathtub. I think we got a bath once a week. That was quite an experience. We did not know any better, you know we were living out here. I remember when we had to go into town we were scared to death of Tucson. I was about seven and he was about a year or two younger. I guess it was a couple of years that we lived here. (Some records that Henry has given OVHS document his mother was postmistress here at the ranch). We enjoyed it, we thought it was a great place, like I say we didn’t know any better. I can remember we had jerky up in the top room. There were lines and the jerky was on those lines up there. And whenever they would kill a calf or cow we would get jerky. I can remember there was a lot of meat up there. We would go up there and sneak some of that jerky. I guess they would bring out stuff like flour and sugar in big bulks. We could go into Hayden and Winkelman it wasn’t too far. There was a good merchandise store in Winkelman Drugstore was in Hayden. It wasn’t that isolated. The store had provisions for sale and I guess they did not have any meat or anything that would be bad, they had all kinds of merchandise. I don’t remember growing melons or vegetables out here but we might have grown some corn in the fields. My dad did a lot of hunting, we had quail and dove and duck. We had eggs, we had chickens and we probably had watermelon We had a lot of chickens. Those coyotes and rest of them were always after them, skunks. I can’t remember worrying very much about it I just know that we always ate well, ate a lot of meat. They had to keep it somehow, they didn’t have any ice. Maybe they brought ice out when they came from Tucson, I don’t know. We had an old Overland car, I don’t know where it came from. I’ve never heard of another Overland car. When we would drive to Tucson we usually have two flat tires, my dad would have to change the tire, put in a new tube and pump it up, that old road. That was always an experience, driving back and forth to Tucson Things always seem to go along very well out here. I don’t know exactly where we got our water, but know we had water in the kitchen, must have brought it in. I can’t really remember about the water. Course I was a little kid, and they didn’t let us wander too far cause there were lots of rattlesnakes. We would go to that school, we didn’t have far to go and come on back home. I think my mother kept pretty close touch I can’t remember going down across the river. I can remember when I was a kid, we drove up to Aravaipa on a weekend with a whole bunch of people. There was a house up there at the end and they had apple cider. Everybody went up there and had apple cider and apples. That was a big deal, clear at the end of Aravaipa. Another thing I just remembered, there was an old fellow by the name of I think Wilson, lived in the house, rented. He had a Gypsum claim on the other side up here. I can remember my dad coming in one time and talking about someone up there and dropped a drill and it took quite a while to hear it hit. That old fellow was always going to make a lot of money on gypsum, I don’t know if he ever did, but I can remember him, he lived here. The foreman’s name was Voil, he was a good man, he lived here for a number of years. The foreman lived in a building right up there on the other side, Voil, he had a family. The kids were part of the school. I guess they were the only other ones that lived down here other than my family. 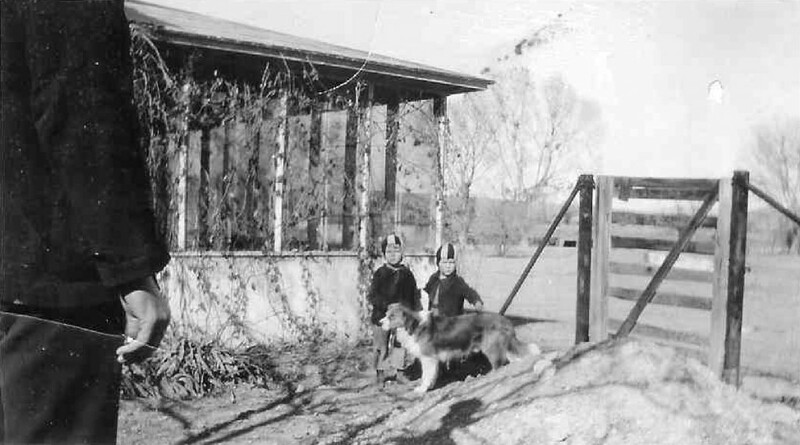 Henry Zipf and his Brother with Dog named Ben. This corner of the house is where a picture was taken when Henry was 7 years old and his brother was 6. Henry brought the photo to show everyone and gave it to OVHS for their files. There used to be a fence here. The dog’s name was Ben, he was a collie. 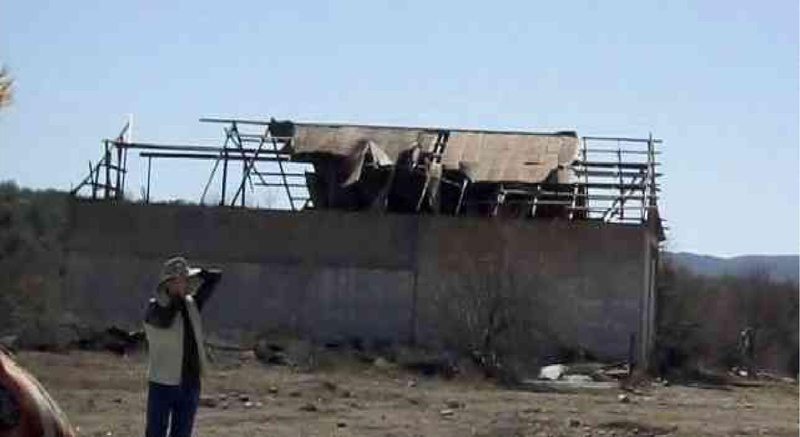 That old wood structure over there was the foreman’s house, it was pretty substantial, his family lived there. Really not sure if it was the wood structure of the white one next to it. That joke I was trying to tell you about, it was those burros. The comic strip was Spark Plug. We both wanted to name our burrow Spark Plug. So we flipped a coin, I named mine “Spark” and he named his “plug”. I guess she wasn’t successful, to preserve it. She lived in Curley, I had correspondence with her and that type thing, but I haven’t heard from her in quite a while. She was a nice lady, trying to do something with it. 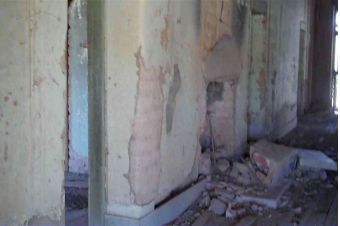 That old granary, last time I was out here, it was in pretty good shape, it’s got cement walls. There was a lean-to along side where that white area is, that was where the schoolhouse was. My granddaddy used to own the Willow Springs over here, he bought it in 1932, sold it in 1937. You all know Boyd Wilson, he was an old client of mine, a friend. His son still runs that ranch, Ralph still runs the ranch. I was an attorney, you didn’t specialize in those days, just took what came in. John Leber was an attorney too (recently part owner/operator of Steam Pump Ranch). His dad (Hank) who lived in Phoenix bought land, bought a lot of land in Phoenix. So Hank came back and had a pot full of dough. He lived out there at Steam Pump and during the war. You know in those days a rancher would locate where there was water. (For current fields use well water, pumped from about a 130-foot depth). This is an old well right down here too, I can remember the well and see the water come out. As a kid, I can remember the head gate, and they decided one year to clean up the lake, so they opened the head gate. Everyone from around here came with gunny sacks, and filled them with fish Drained the lake and cleaned it up then put the head gate back on. I can remember that because all those guys were down there with gunny sacks, a lot of carp in there. We visited the lake site, no comments recorded by Henry. On way back to Mammoth for lunch, we stopped at the old Cook Ranch. The main ranch house has been removed, an old building still stands. We used to come in here (Cook Ranch), the old man and his wife used to live in the house. We drove right down here and the trees were on each side and they were at the end of the lane. It was a very pretty spot. They were of course right next to where all the water was. I don’t remember the house as being a very big place. I just remember one house. 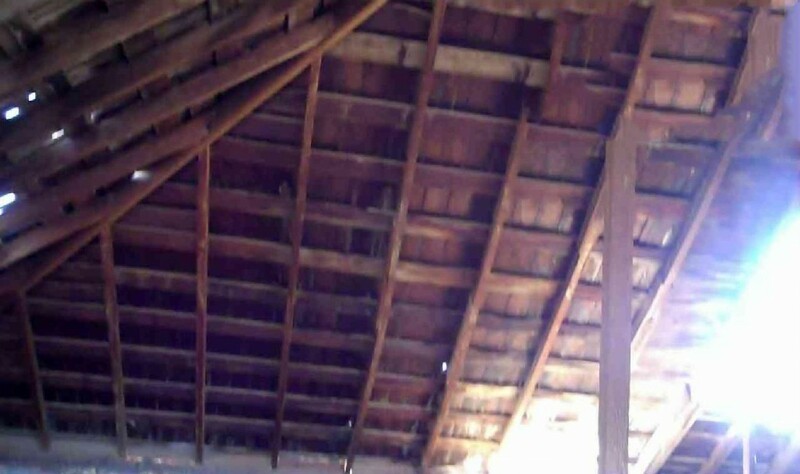 They may have had a barn. I do remember all these big old trees. And then there was an old guy that came in later and bought it, he came out of Aravaipa, I can’t remember his name, Fleager it was. He was a member of the Club and so was I. He had some kind of a problem, not sure what it was, maybe it was murder. Was a tough old guy. This was really a beautiful area in the Spring and Summer with all the trees in bloom. I guess they are just going to let it go back (137 acres). Remember when I said they came in a wagon, called it the Finch, it wasn’t. It was the Putnam Wash, and they had real floods in it. There was an old house up on the side of the hill. 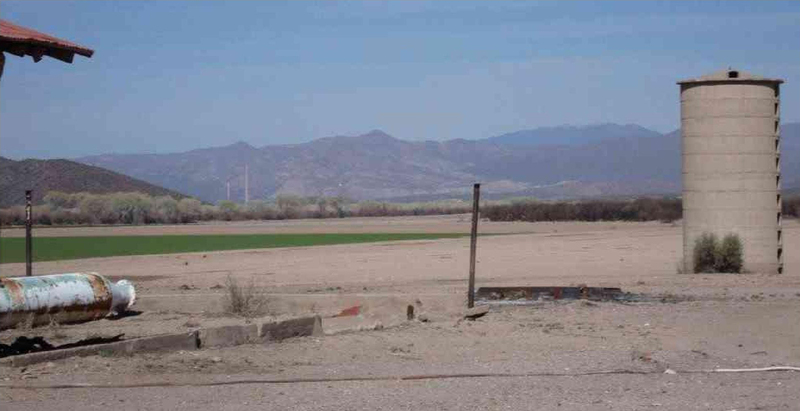 It was deserted because a flood had come in And it was up on the side too, the Putnam wash had big floods. The Apaches were right below you. The Indians would come out and greet my granddad, right down the Putnam wash, it was a rough wash My Dad and Mother each had a horse, they took one of us, my brother on one horse, me on the other. We came from Steam Pump across the Antelope Plains to the Putnam Wash, I think that is the way they rode. I can remember hearing the Putnam Wash.
We then left the Cook Ranch to have lunch at a Mexican restaurant in Mammoth. Additional comments were recorded at my end of the table, mostly from Ben Williams about his dealing with Henry, Raul Castro, and others. The video ran out of memory about 29 minutes into lunch so some of the comments and stories were missed. The transcription above was completed on March 3, 2010, by Joe Frannea. An HD video from a flip camera was used to record the interview/tour and to create this document. The main purpose was to capture audio, not the video. Some of the photos are single frame shots from the HD video. Video and transcription by Joe Frannea (OVHS), photos by Joe and Patsy Frannea. 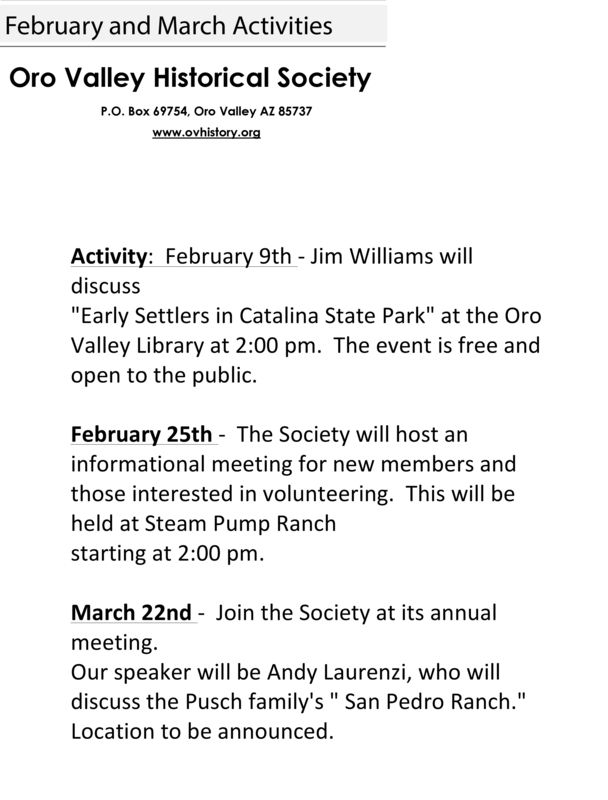 The purpose of the tour was to gain insight from Henry Zipf about the PZ Feldman Ranch Oro Valley Historical Societies (OVHS) continuing pursuit is to document ranching history in the greater Oro Valley area. The questions from tour group members were not included but Henry’s answers reflect the question asked. This transcript was reviewed by Henry Zipf for accuracy and OVHS has received written approval from Henry for the exclusive use of this document. This first video segment with Henry talking to the whole group by his car is 34 minutes long. The segments are recorded in separate files (MP4) and start at file name VID00016 and go to VID00028. These have been copied to 2 DVDs for OVHS archives. Occasionally, there are summary sentences or phrases from Henry’s comments due to so many different people talking at once. There is other interesting information on the videos from others that is not transcribed for this document. 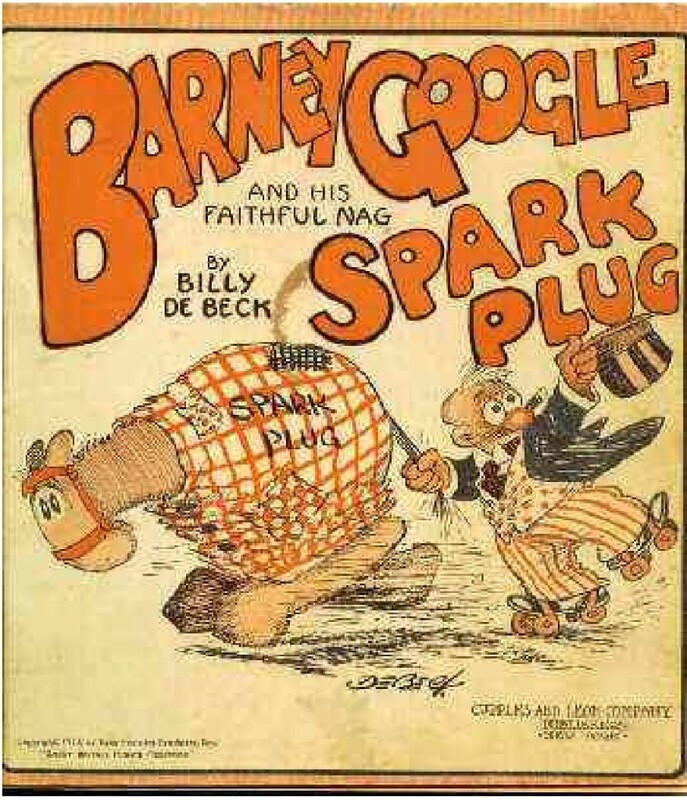 Henry made reference to one of his favorite comic strips on page 5 and page 7, “Spark Plug Below is some information on Spark Plug from the Internet. 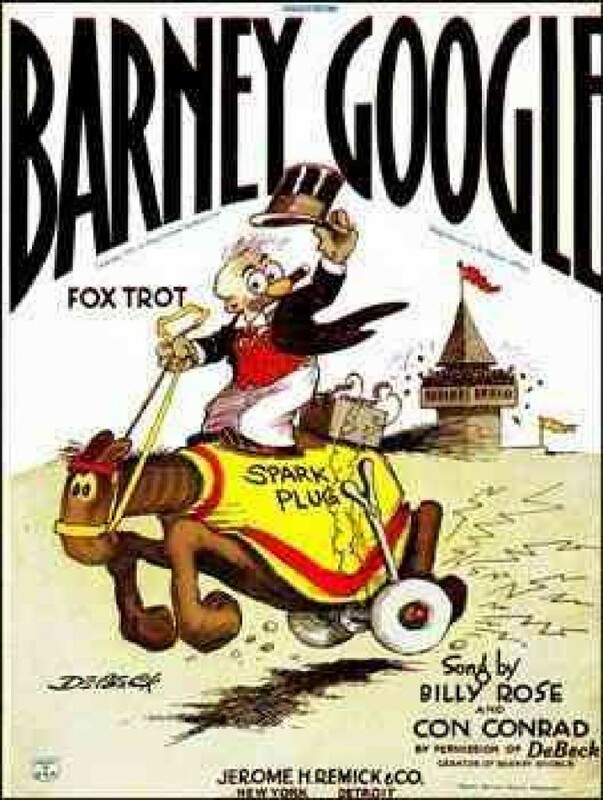 Barney Google was a comic strip begun by Billy DeBeck in 1919, under the overly wordy original title Takes Barney Google, Frinstance. It was soon changed to Barney Google, and in 1922, Barney, who was a short hard on his luck fellow, was gifted an inept race horse named Spark Plug. In 1924, the strip went to even greater heights when Barney and Spark Plug found themselves in the mountains of North Carolina, where they met up with the equally tiny hillbilly, Snuffy Smith. Americans sure loved them their hillbillies (see Li’l Abner for proof of that), so Snuffy was a great addition to the strip, and soon it was retitled Barney Google and Snuffy Smith. In fact, during the 1950s, Barney and Snuffy parted company, but Snuffy got to keep the strip!!! It continues to this day as Barney Google and Snuffy Smith, but Barney only occasionally shows up to visit.